Auchincloss sets his sights on a big, familiar target: the rich and shallow elite, and the peculiar troubles specific to them. In this case, the setting is Averhill, a New England boarding school. 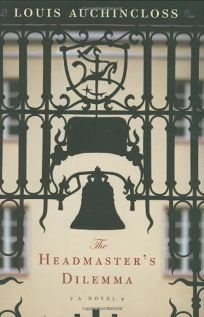 It's 1975, and headmaster Michael Sayre has a crisis on his hands: there's been a homosexual assault in the boy's dorm. His attempt to handle the matter quietly and fairly plays directly into the hands of sinister Donald Spencer, Michael's old classmate, chief nemesis and chairman of the board of trustees. Determined to ruin Michael's efforts to transform Averhill into a progressive institution (Michael initiates co-education, among other reforms), Donald foments outrage among the parents of the two boys involved and plots to force Michael's resignation and return Averhill to its stodgy old ways. The narrative flows smoothly, but the prose-especially dialogue-is pockmarked with linguistic anachronisms (""all wet,"" ""pinkos,"" ""what a lark! ""), as if the novel has been sitting in a drawer for 50 years and underwent a hurried updating. Though old-fashioned feeling, this newest offering from a veteran writer (Auchincloss has published more than 60 books) entertains with its depiction of American aristocrats.